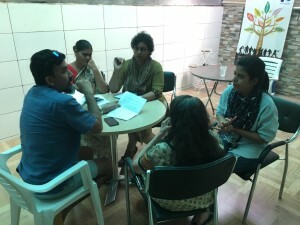 It started with a brief icebreaking session where all the participants (caregivers) introduced themselves and shared their experiences about their loved ones and their relation with Samvedna Senior Care. 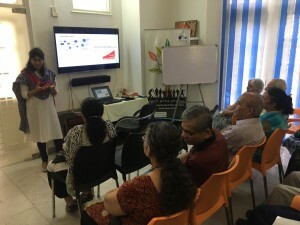 Dr. Jayashree Dasgupta initiated the talk while focusing on various aspects of caregiving. She shared the concept of stigma and how it affects the mental well-being of family members. One of the caregivers shared why it is important to share the truth about the disorder to the patient instead of hiding it from the patient. In the same discussion some caregivers also pointed out that how difficult it is to apply this notion in Indian context. Further, it was covered the importance of Cognitive Stimulation Activities and why it is important to indulge the patients into activities or hobbies that they use to love doing. Caregivers also shared the issue in socializing and Dr. Jayashree address this issue and suggested solutions. Lastly the session ended with question and answer rounds where some caregivers discussed their problem and how Samvedna Senior Care can help them.